It seems that when I bake cupcakes they are always chocolate. It’s kind of the norm. 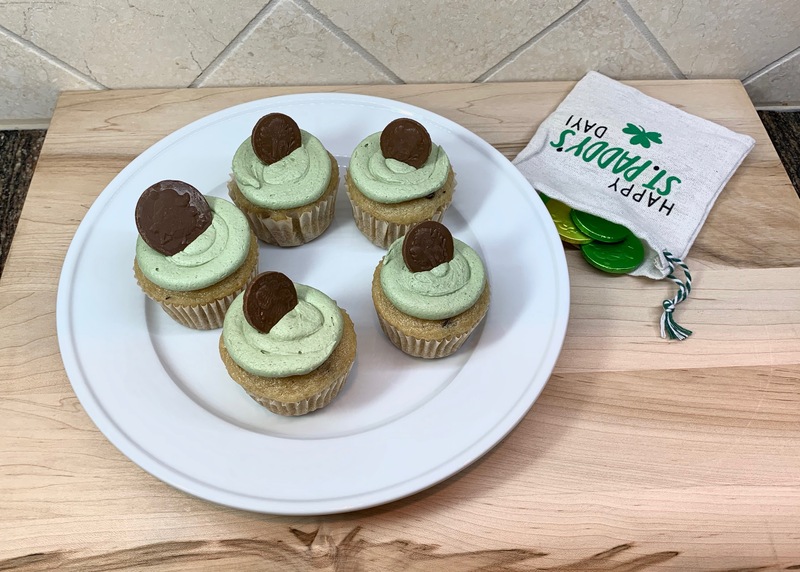 So when I decided to make cupcakes this week, I went in search of a vanilla cupcake recipe. 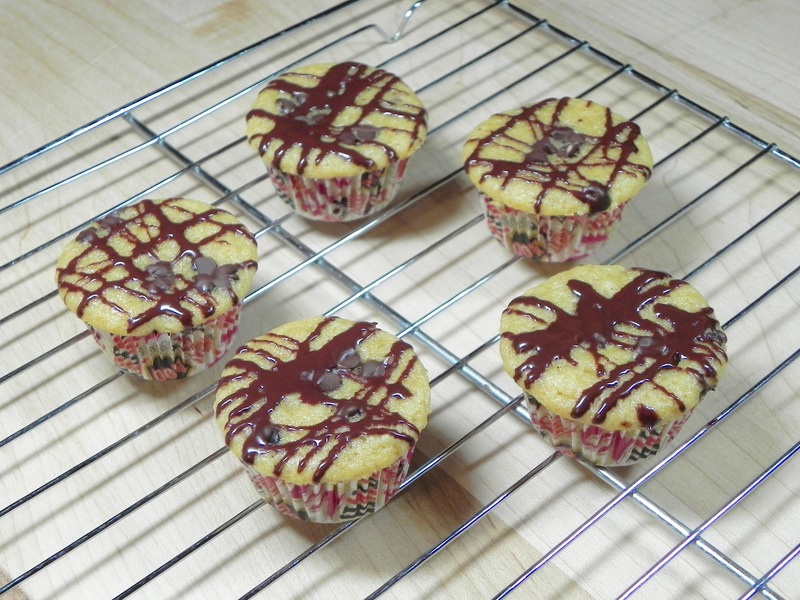 What I found was a recipe for cupcakes with chocolate chips and knew it would be perfect. To adapt for high altitude I added milk and a little flour. I then reduced baking powder and oil. They were already vegan so that was simple, but I did add more chocolate chips and a drizzle so they wouldn’t seem too un-chocolatey. They weren’t the usual, but they were pretty good. Position a rack in upper third of oven and preheat to 350F. Line a mini cupcake tin with paper liners. In a small bowl, mix vinegar and milk. Set aside for 10 minutes to clabber. Place a wire mesh strainer over a medium bowl. Add flours, sugar, baking powder, baking soda, and salt to strainer. Stir with a whisk to sift ingredients into bowl. (If any small bits remain in strainer, add them to bowl.) Whisk to aerate the mixture. Whisk oil and vanilla into clabbered milk. Add wet ingredients to dry and whisk until batter is smooth. Stir half the chocolate chips into batter. Divide batter evenly between cups, filling each halfway full. Sprinkle remaining chocolate chips on top of batter, dividing evenly between cups. Bake for 11 to 13 minutes or until a toothpick inserted in center comes out clean or with a few crumbs. Cool tin on a wire rack for 5 minutes. Lift cupcakes onto rack to cool completely. Drizzle with melted chocolate. Refrigerate cupcakes in a covered container for up to two days. Makes 28-30 mini cupcakes. For my New Year’s Eve Celebration I had to come up with something special. Something chocolate. And champagne. And strawberry. I saw pipette kits for infusing cupcakes with liquid and knew I had my solution. I just had to bring it all together. My standby chocolate cupcake recipe was the base so I didn’t need to make adjustments there. 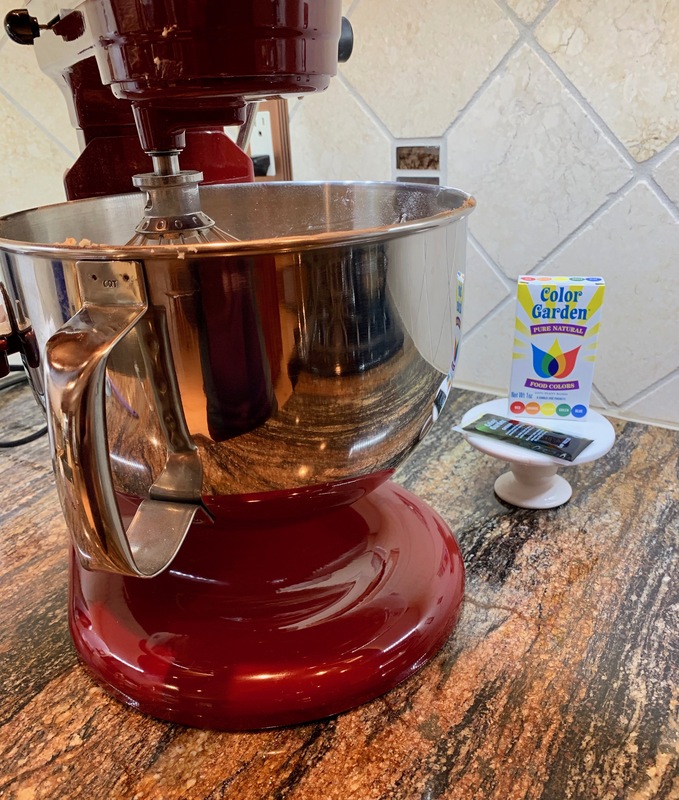 I added powdered dried strawberries to the frosting to complement the champagne that would be imbued into the cupcakes. I now had a decadent dessert worthy of ringing in the New Year. Happy and Decadent 2017 to all! For Cupcakes: Preheat oven to 350F and line a 12-cupcake pan with paper liners. Whisk together the milk and vinegar in a large bowl, and set aside for a few minutes to curdle. Add sugar, oil, and vanilla to the milk mixture and beat until foamy. In a separate bowl, sift together the flour, cocoa powder, baking soda, baking powder, and salt. Add in two batches to wet ingredients and beat just until no large lumps remain. Pour evenly into liners, filling three-quarters of the way. Bake 18-19 minutes, until a toothpick inserted into the center comes out clean. Transfer to a cooling rack and cool completely. For Frosting: Beat shortening and margarine together until well combined and fluffy. Add powdered sugar and beat for 3 more minutes. Add dried strawberries, vanilla and milk and beat for another 5-7 minutes until fluffy. 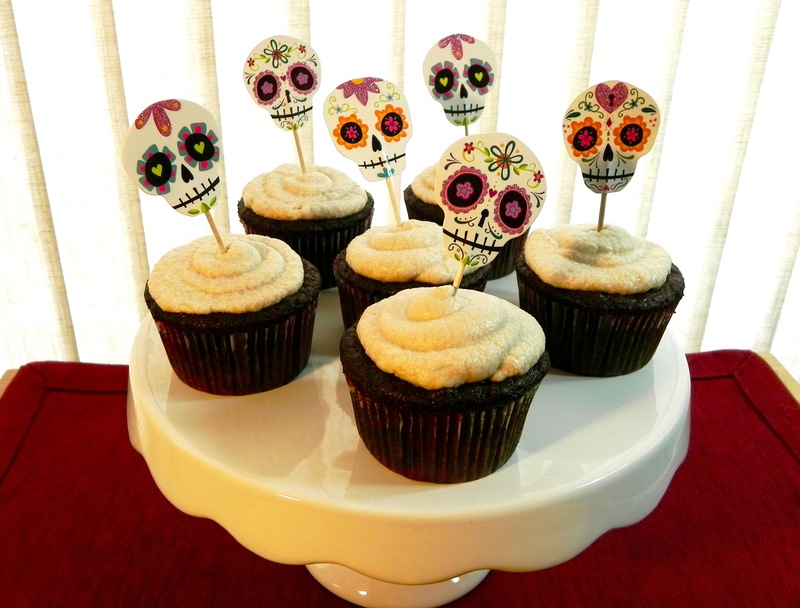 For Decorating: Frost cooled cupcakes. Dip pipettes into champagne and draw some liquid up into the bulbs. 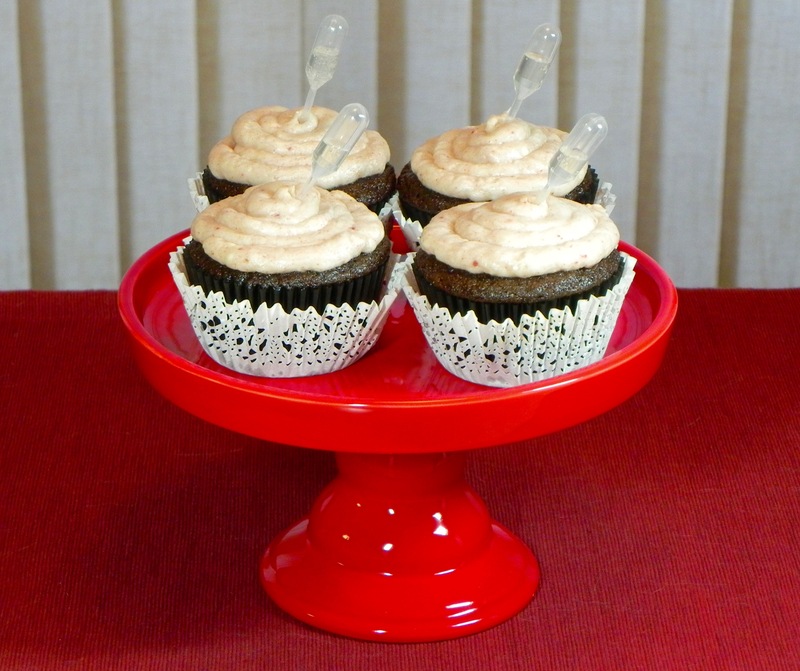 Insert pipettes into cupcakes without squeezing; you will squeeze them just before eating. 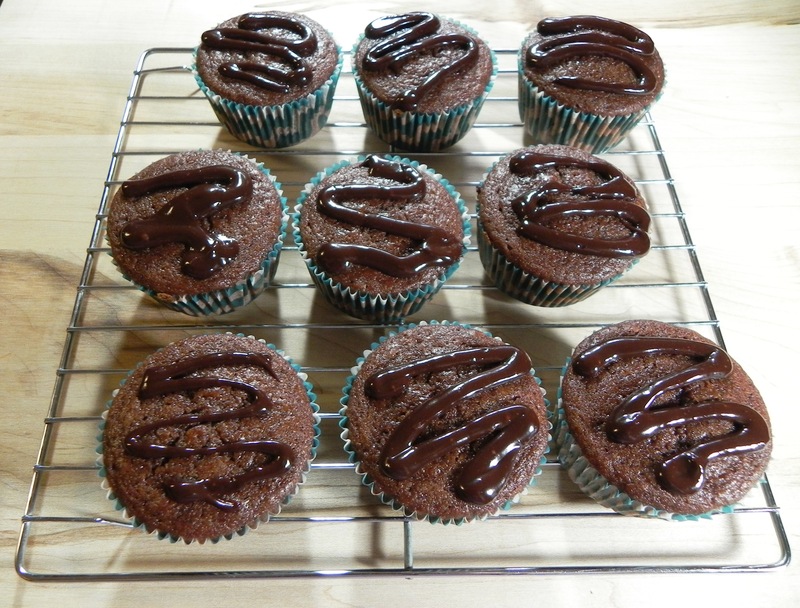 Today is all about chocolate with my chocolate-filled chocolate cupcakes. I saw a recipe for chocolate lava cupcakes and figured that who could go wrong with chocolate and more chocolate. Let’s just say my chocoholic hubby was very excited. The changes I made to the recipe I adapted were extensive because I felt the recipe would make too much batter. I down-sized the measurements and then reduced the baking powder more to account for high altitude. Then I added more liquids for the dryness at altitude. The last big alteration was to omit the frosting because they seemed a bit sugar-laden for my tastes. I saved some filling and used the extra ganache for a nice topping. Yep, hubby was glad to be a taster. Preheat oven to 350F. Line a muffin tin with 12 paper liners. Melt chocolate for filling. Whisk in milk and powdered sugar. Set aside. In a bowl, start batter by adding milk and apple cider vinegar. Let sit for 15 minutes to curdle, then add sugar, oil and vanilla. Whisk until well mixed. In another bowl whisk together flour, cocoa powder, baking powder and salt. Add dry ingredients to wet ingredients and whisk until mixed. Fill cupcake liners 1/3 full with batter. 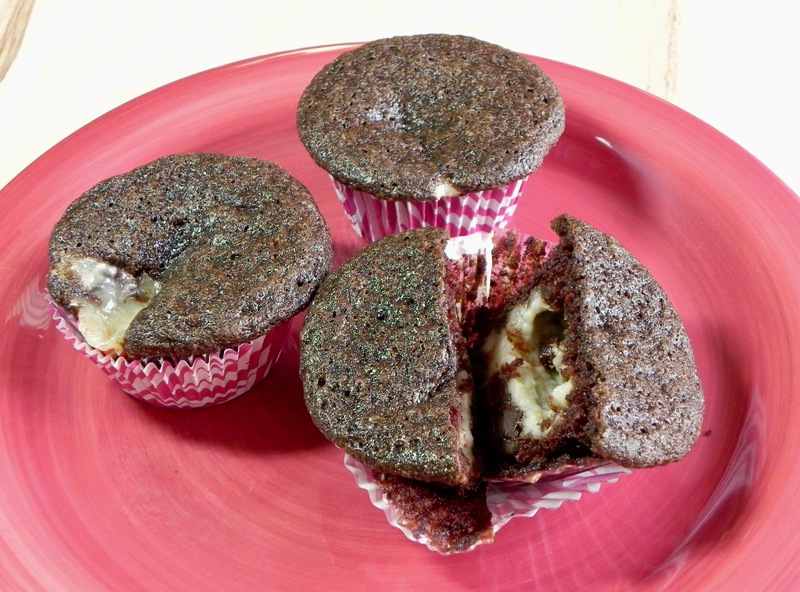 Place a dollop of filling in center of each cupcake, with extra filling reserved for garnish. Do not let filling touch sides of liners. 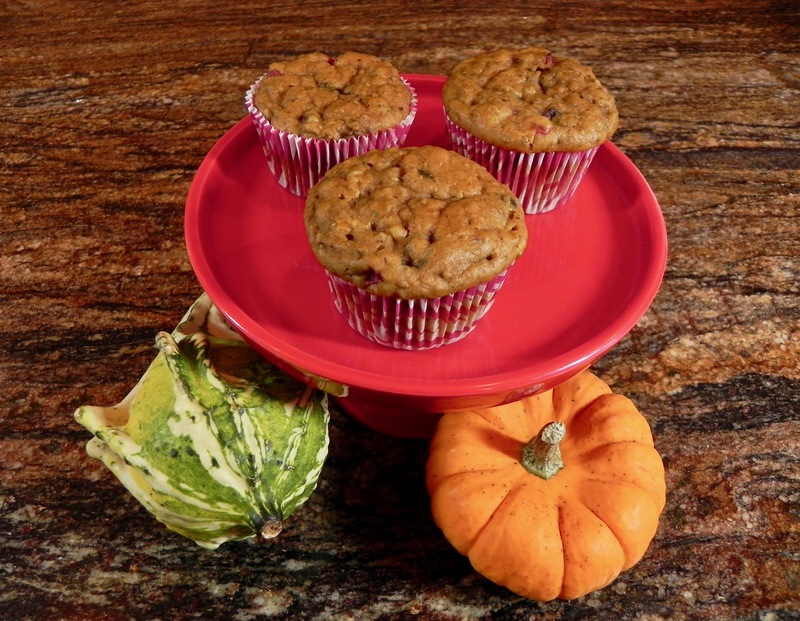 Use remaining batter to fill each cupcake liner 2/3 full. Bake for 22-24 minutes. Let cool completely. Drizzle remaining filling over tops of cupcakes to garnish.